Can anyone tell me how the suncoast are constructed? My dealer says it's an all glass boat with no wood in the construction but I read several places that the stringers and floors are encapsulated wood in fiberglass. Is the hull filled with foam like a ranger or a Boston whaler. The chaparral website is horribly lacking this type of detail. Thank you for your assistance. Only the factory & the workers really know. Or someone with a drill & holesaw or chainsaw. Companies are not required to say what or how they build the boats. The important part is how the plastic holds up over many years. The web is a terrible place to get facts on a subject like this. Go take a factory tour at Chaparral. I did, a number of years ago. It was fun and informative. Got to see the manufacturing process up close. Great southern hospitality, too. Encapsulated wood stringers. Plenty of glassed wood in the Suncoast, like all other Chap's. WORD. Took the tour to see my 250 Suncoast in production. Encapsulated wood and I didn't notice any foam. Chaps buzz word for wood is "perma-panel" It is manufactured by Inland Materials. It is Marine Plywood. It has a lifetime warranty. That doesn't necessarily transfer to the boat. Their warranty assumes no penetration of the product. I don't quite understand how you could use this stuff with driiling or screwing etc. But if sealed properly, I doubt that you'll have any problems. the tour is good, they pretty much let you see everything. robin comfort drove us around in a golfcart and i got see my boat being built. i went to the regal factory years ago as i live in orlando.....they did not let gou see much. Ocean alexander just opened a plant in merritt island, i would love to see those being built. Teak Freak, How are you liking the Sun Coast? I have been real interested in the performance and comfort. I'Il chime in on this as a suncoast owner. have 13 hours on my Suncoast 230 and have been pleased with it so far! The 200 motor with digital throttle has enough juice for intercoastal crusing and few ocean excursions. The 300 moves the boat effortlessly and you will probably never want to run it at WOT. It goes without saying that the seating is plentiful, as is the stowage under them. Except for the front seats that lift open via hinge, the other seats are a little bit of a pain to take off. Not a big deal but worth a mention. 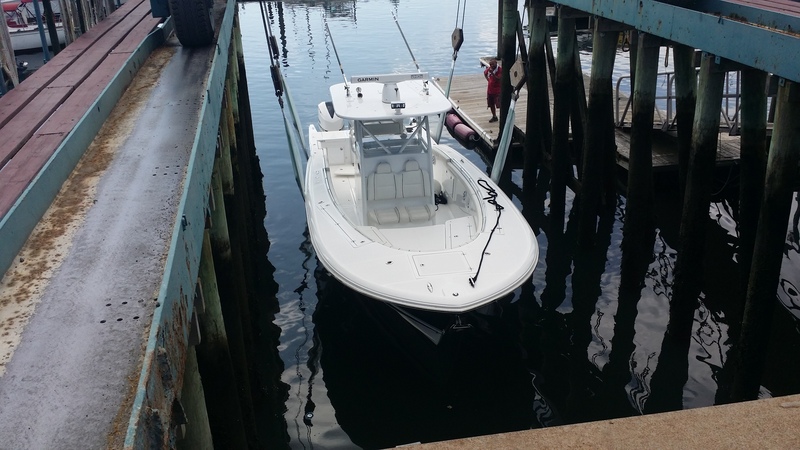 Its a great day boat for island hopping, beaching, and water sports, as the handling and steering radios is phenomenal. If your concidering a Suncoast, the arch is a Must !! Unlike a typical Bimini that makes a racket and seems like it wants to blow off while underway, the setup with the arch is rock solid. 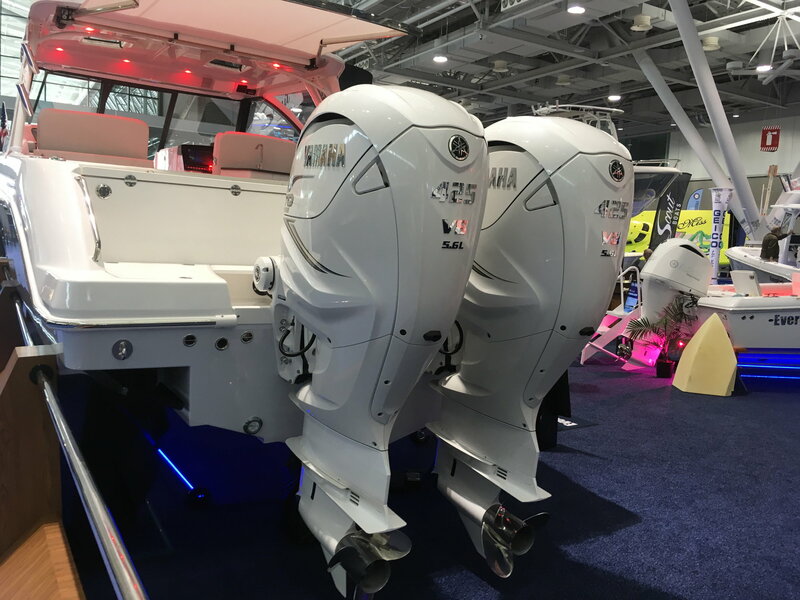 Buddy of mine was at the NE boat show yesterday. 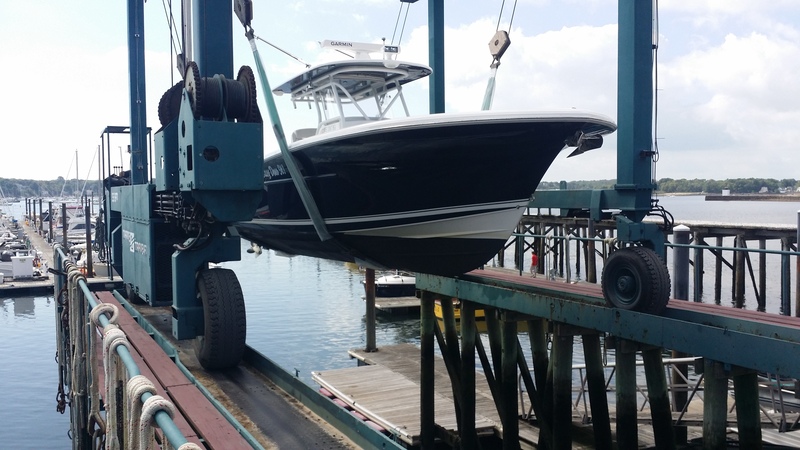 He's looking to upgrade from a CC to something like the Suncoast that has more comfort and cruising than strictly open deck for fishing but with outboards. 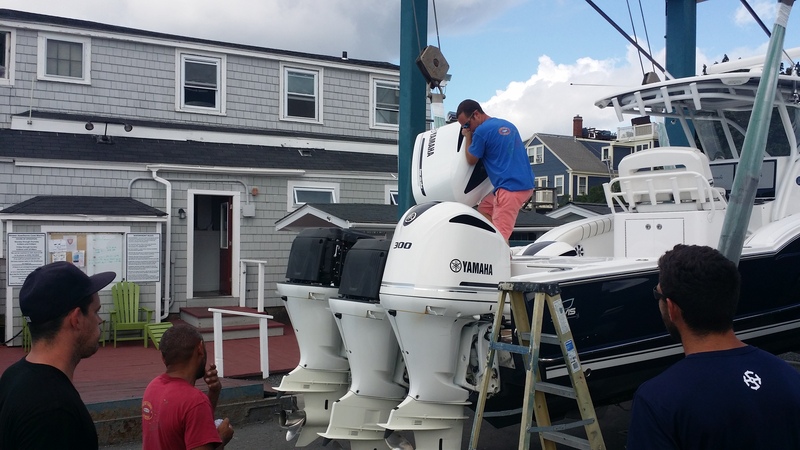 He said there's a lot of choices but he wants one with the new Yamaha V-6 5.6L 425. Word is these things pack a punch like none other. He had his eye on this one. Good shot Hatem. Sure hope that circular black ring to the left of the prop area is NOT a self draining SCUPPER. Neighbors new Trophy has 2 down low looking like that. I go out to my boat & his boat looks odd in the water. I walk to his & look inside. Water is just starting to come over the floor boards. His is thankfully a O B boat Short story. Bad luck on the scuppers Q C . Dealer said that is a constant Trophy problem with the small Zebra Mussels we have. Who with any boating years would ever depend on a rubber flap to stop water from leaking in ? A day. A week . Month ? He was lucky in a floating dock of boats. Private isolated dock ? If he had a S D or inboard ? MAJOR soaked engine parts. I suggested he have them plugged. Was afraid that would violate his WARRANTY. After the warranty Or a used boat ? Below the water line scuppers are N G in my opinion. Battery had run down. I got my jumpers & used a neighbors boat to start the O B & get the bilge pump running. those 425's are something like 40 to 45 grand each. I think that Grady White is around $500K lolol. Going to the show later today. Reminded me one day this past summer arriving at the marina, they were just wrapping up work on this CC that belongs to a really nice fella who goes out fishing with his two little kids all the time. 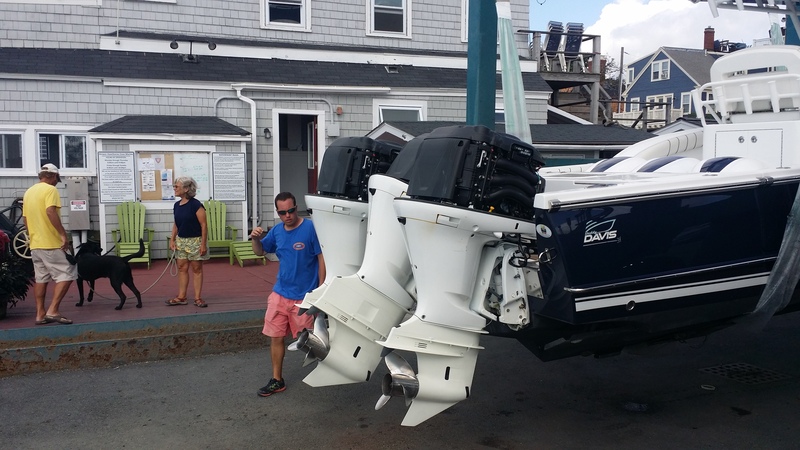 I'm not too much into outboards, but whenever I see them or get a chance to witness work being done on them up close, I'm always fascinated and take pics of everything. 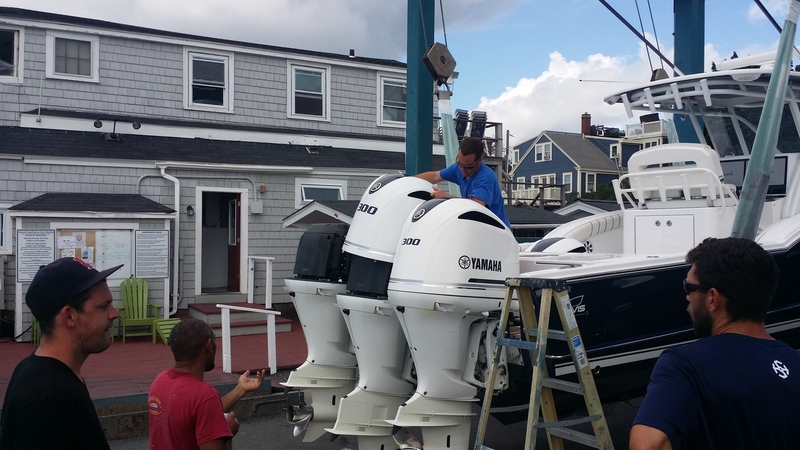 These 3 Yammy 300s probably push that boat really nicely.